9:26 PM Posted by Tony A. 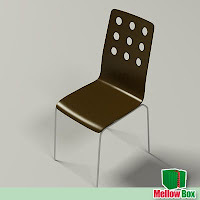 9 dragons contemporary stackable chair. Object is made of quads with emphasis on correct topology.Poly count can be easily changed by adjusting the meshsmooth modifier iterations. Poly count with meshsmooth iterations set on 0 is 1290. Materials, lights preset for a studio shot and cameras are included. Previews rendered with Vray. It's recommended to use hdr map for reflections to get realistic results (the hdr map is included). The scene is Vray render ready, just hit render to get the results you can see in thumbnails.